About Resolution... 8, 10 or 12 bit? The ADC-4U series A to D converter provides 4 channels of 8, 10 or 12 bit A to D input. The analog inputs may also be configured for (2) differential inputs. The ADC-4U8, ADC-4U10 and ADC-4U12 connect to any available USB port with operating power supplied from the USB port. The VA-1 or VA-2 Precision Instrumentation Amp may be used to input lower millivolt signal levels when voltage input levels fall below the 0 to 1 volt minimum (saving the analog input). Up to 136 relays may be controlled or 136 status inputs may be monitored (or combinations) with the addition of the optional expansion ports and the EX-8M Expansion Module (or EXM-8, EXM-16 or EXM-32 Relay I/O Expansion Modules). The 8 bit inputs (ADC-4U8) provide 256 increments of measurement each. The 10 bit inputs (ADC-4U10) provide 1,024 increments of measurement each. The 12 bit inputs (ADC-4U12) provide 4,096 increments of measurement each. The EN-D Instrument Case may be used to house the ADC-4U if an enclosure is required. Includes free event notification software for Smart phones (text message alerts). LabVIEW compatible, includes LabVIEW VI, graphic software example and DLL library. Software interface, driver, data logger software, remote network/Wi-Fi software and source code examples included on CD. The ADC-4U series is also available in WiFi version (ADC4-WIFI), Ethernet version (ADC4-ENET), RS-232 version (ADC4-RS232) or RS-485 version (ADC4-RS485). The ADC-4DU8 A to D converter provides (4) channels of single ended (8 bit) A to D input with an additional channel of Digital to Analog output. The analog inputs may also be configured for up to (3) differential inputs. The ADC-4DU8 connects to any available USB port with operating power supplied from the USB port. The VA-1 or VA-2 Precision Instrumentation Amp may be used to input lower millivolt signal levels when voltage input levels fall below the 0 to 1.6 volt minimum. Up to 136 relays may be controlled or 136 status inputs may be monitored (or combinations) with the addition of the optional expansion ports and the EX-8M Expansion Module (or EXM-8, EXM-16 or EXM-32 Relay I/O Expansion Modules). The 8 bit inputs provide 256 increments of measurement each. The EN-D Instrument Case may be used to house the ADC-4DU8 if an enclosure is required. Includes free event notification software for Smart phones (text message alerts). LabVIEW compatible, includes LabVIEW VI, graphic software example and DLL library. Software interface, driver, data logger software, remote network/WiFi software and source code examples included on CD. 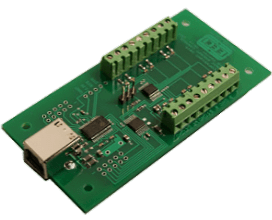 The ADC-4DU8 is also available in WiFi version (ADC4D-8WIFI), Ethernet version (ADC4D-8ENET), RS-232 version (ADC4D-8RS232) or RS-485 version (ADC4D-8RS485). The ADC-4U11 A to D converter provides (4) channels of single ended (11 bit/2,048 increments) A to D input or (2) channels of (12 bit/4,096 increments) differential inputs. The ADC-4U15 A to D converter provides (4) channels of single ended (15 bit/32,768 increments) A to D input or (2) channels of (16 bit/65,536 increments) differential inputs. The ADC-4U11 and ADC-4U15 connect to any available USB port with operating power supplied from the USB port. The VA-1 or VA-2 Precision Instrumentation Amp may be used to input lower millivolt signal levels when voltage input levels fall below the 0 to 250 millivolt minimum. Up to 136 relays may be controlled or 136 status inputs may be monitored (or combinations) with the addition of the optional expansion ports and the EX-8M Expansion Module (or EXM-8, EXM-16 or EXM-32 Relay I/O Expansion Modules). The EN-D Instrument Case may be used to house the ADC-4U if an enclosure is required. Includes free event notification software for Smart phones (text message alerts). LabVIEW compatible, includes LabVIEW VI, graphic software example and DLL library. Software interface, driver, data logger software, remote network/WiFi software and source code examples included on CD. The ADC-4U11 and ADC-4U15 are also available in WiFi versions (ADC4-15WIFI), Ethernet versions (ADC4-15ENET), RS-232 versions (ADC4-15RS232) or RS-485 versions (ADC4-15RS485). The ADC-8U series A to D converter provides 8 channels of 8, 10 or 12 bit A to D input. The analog inputs may also be configured for (2) differential inputs. The ADC-8U8, ADC-8U10 and ADC-8U12 connect to any available USB port with operating power supplied from the USB port. The VA-1 or VA-2 Precision Instrumentation Amp may be used to input lower millivolt signal levels when voltage input levels fall below the 0 to 1 volt minimum (saving the analog input). Up to 136 relays may be controlled or 136 status inputs may be monitored (or combinations) with the addition of the optional expansion ports and the EX-8M Expansion Module (or EXM-8, EXM-16 or EXM-32 Relay I/O Expansion Modules). The 8 bit inputs (ADC-8U8) provide 256 increments of measurement each. The 10 bit inputs (ADC-8U10) provide 1,024 increments of measurement each. The 12 bit inputs (ADC-8U12) provide 4,096 increments of measurement each. The EN-D Instrument Case may be used to house the ADC-8U if an enclosure is required. Includes free event notification software for Smart phones (text message alerts). LabVIEW compatible, includes LabVIEW VI, graphic software example and DLL library. Software interface, driver, data logger software, remote network/WiFi software and source code examples included on CD. The ADC-8U series is also available in WiFi version (ADC8-WIFI), Ethernet version (ADC8-ENET), RS-232 version (ADC8-RS232) or RS-485 version (ADC8-RS485). The ADC-12U series A to D converter provides 12 channels of 8, 10 or 12 bit A to D input. The analog inputs may also be configured for (6) differential inputs. The ADC-12U8, ADC-12U10 and ADC-12U12 connect to any available USB port with operating power supplied from the USB port. The VA-1 or VA-2 Precision Instrumentation Amp may be used to input lower millivolt signal levels when voltage input levels fall below the 0 to 1 volt minimum (saving the analog input). Up to 136 relays may be controlled or 136 status inputs may be monitored (or combinations) with the addition of the optional expansion ports and the EX-8M Expansion Module (or EXM-8, EXM-16 or EXM-32 Relay I/O Expansion Modules). The 8 bit inputs (ADC-12U8) provide 256 increments of measurement each. The 10 bit inputs (ADC-12U10) provide 1,024 increments of measurement each. The 12 bit inputs (ADC-12U12) provide 4,096 increments of measurement each. The EN-D Instrument Case may be used to house the ADC-12U if an enclosure is required. Includes free event notification software for Smart phones (text message alerts). LabVIEW compatible, includes LabVIEW VI, graphic software example and DLL library. Software interface, driver, data logger software, remote network/WiFi software and source code examples included on CD. The ADC-12U series is also available in WiFi version (ADC12-WIFI), Ethernet version (ADC12-ENET), RS-232 version (ADC12-RS232) or RS-485 version (ADC12-RS485). The ADC-16 A to D converter provides two separate 8 channel analog input ports (expandable to 48 analog inputs) which allow input of a wide variety of analog information into a conventional PC. Applications include temperature input (requires TE-8 temperature input conversion and sensors) and input of energy usage or electrical demand (requires watt transducer and current transformer). Other uses include input of pressure, light, voltage, weight, potentiometer movement, strain gauges, etc. (minimal external hardware required). The ADC-16 is very useful as a Data Logger or as an Electronic Chart Recorder. The data logging software for Windows which is provided with the ADC-16, allows the user to export data files into Excel or other programs to generate spreadsheets, charts, graphs etc. The ADC-16 may be used in battery management systems to monitor and control battery voltage levels and system operating characteristics. The ADC-16 also has many applications in the home automation field. Connection of a modem will allow these functions to be monitored from a remote site via telephone line (the EX-16 may be used for remote relay control) or use an Internet connection. The A/D output is represented as a single byte number (0 to 255 decimal) with 8 bit resolution or in two byte format (0 to 1023 decimal) with 10 bit resolution. Voltage inputs of 5 millivolts or higher per increment require no additional hardware. The VA-1 or VA-2 Precision Instrumentation Amp may be used to input lower millivolt signal levels, for input scaling or to input differential signals. Each of the two analog input ports has an adjustable voltage reference input which allows the analog voltage input level to be adjusted. The default level is 0 to 5 volts DC single ended (20 millivolt resolution, 8 bit). The addition of an external voltage reference will allow greater resolution and lower voltage input levels. EXAMPLE: A 1.2 volt reference will provide a voltage input level of 0 to 1.2 volts (5 millivolt resolution, 8 bit). Inputs can be ratio metric or standard volt. The ADC-16 A/D converter provides an output expansion port to control up to 112 relays (using EX-16 or EX-32 expansion cards) and an input expansion port which allows for expansion to 48 analog inputs or an additional 128 status (digital) inputs (using AD-16 or ST-32 expansion card). The TE-8 temperature input conversion may be used for temperature input. Includes free event notification software for Smart phones (text message alerts). ADC-4 A to D CONVERTER...The ADC-4 provides four 12 bit analog inputs with an optional 8 channel port #2 of 8 or 10 bit resolution. The ADC-4 features the Siemens 12 bit A/D converter IC with an on-chip micro controller and memory for auto calibration. Total unadjusted error is plus or minus 1/2 LSB with no missing codes. The ADC-4 is identical to the ADC-16 in physical size and layout, I/O functions and expansion capability and provides both the relay expansion and input expansion ports. Analog port #2 may be converted for temperature input using the TE-8. Port #1 is used for connection of the four 12 bit inputs via a shielded DB-9 connector. The A/D output is represented in two byte format (0 to 4095 decimal) in 4,096 increments. Voltage input range is fixed at 0 to 5 VDC single ended. Use the VA-1 or VA-2 Precision Instrumentation Amplifier for lower input voltage ranges, input scaling or for differential inputs. Low cost - High reliability - 25 years of proven performance in the energy management field. Ideal for use as a Data Logger or Electronic Chart Recorder. Data Logger software is included for use with Windows. The data export files import easily into Excel, Access and other programs. LabVIEW compatible, includes LabVIEW VI, graphic software example and DLL library. Includes ADC-16 Data Acquisition Software for Windows (for use with Windows versions 3.0, 3.1, Windows 95/98/2000/ME/XP/Vista and Windows 7, 8 and 10). This software will allow you to display, label, add unit specifier, scale, offset, and log incoming analog information, plus other additional functions. Software is also provided that allow the ADC-16 inputs and/or relays to be controlled or monitored over a network (LAN, WiFi, Internet, etc.). Full documentation is provided, including connection diagrams, pin-outs, hardware interfacing and control software examples. A CD is provided with each order with several Windows desktop and Network Apps and control software examples in Basic, QuickBasic, C, Assembly, Visual Basic 6, Visual Basic .NET, Visual C++/C# along with test software for use in all versions of Windows or DOS. Optional RS-422 and RS-485 serial interfaces available (distances to 4,000 feet) or direct Internet connection using the CO-LAN. Available in 8, 10 and 12 bit resolution. Control up to 112 Relays, input up to 128 Digital Inputs or up to 48 Analog Inputs. All through a single RS-232 connection (using EX-16, ST-32 or AD-16 expansion cards). Powered from any power supply with a voltage output of 9 to 14 volts DC (specify PS-GP-1 wall adapter for single ADC-16). Analog input connections use a standard 10 contact ribbon cable header socket (.1" centers). A terminal block is provided for power supply and serial I/O connections. The ADC-16 serial interface meets or exceeds the EIA standard for RS-232C data communications. Rack mountable with other 5" by 7" cards using the CH series card holder racks. More detailed information is provided with the ADC-16 documentation. 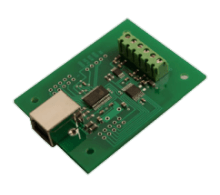 The ADC-16 Temperature Interface has proven to be an extremely reliable industrial grade temperature interface for connection to RS-232, RS-422, RS-485 or USB. It's low cost and proven performance make it the ideal choice for a wide variety of temperature monitoring applications and is for use with all types of computers which provide an RS-232, RS-422, RS-485 or USB connection. *the above products are available with an extended temperature range by adding the 10 bit /G and /H options and/or extended range sensors (see below). The E and F options for the ADC-16 and AD-16 specify that the TE-8 temperature conversion is added in groups of 8 temperature inputs. The E option indicates that the TE-8 temperature input conversion is added to the first 8 channels on the A/D card. The F option indicates that the TE-8 temperature input conversion is added to the second 8 channels on the A/D card. The TE-8 temperature input conversion provides (8) temperature sensing inputs (with temperature sensors) for use with the ADC-8, ADC-16 Analog to Digital Converter the ADC-4 Analog to Digital Converter or the AD-16 Analog Expansion Card. A terminal block is provided for connections to the temperature sensors using a single twisted pair wire. The temperature sensors may be located up to several thousand feet from the TE-8. The TE-8 connects directly to the analog input port with the ribbon cable provided (four TE-8's will provide 32 temperature inputs with an AD-16 expansion card). Includes (8) precision temperature sensors, (8) trimmer potentiometers (for manual calibration, but not required), resistors, capacitors and voltage reference (if the TE-8 is purchased as a kit, the components must be installed on the ADC-16 or AD-16 cards). The temperature sensors are linear temperature sensing IC's supplied in a TO-92 plastic package. The ADC-16 or AD-16/32 may be ordered with the TE-8 installed by adding the suffix /E or /F (see options) or the ADC-16 may be shipped back to us for installation of the TE-8 at no charge. Temperature range is -40 degrees F to 146 degrees F (-40C to 64C) when used with 8 bit converters or -40 degrees F to 212 degrees F (-40C to 100C) when used with 10 or 12 bit converters. Extended range sensors are also available with a temperature range of -67 degrees F to 302 degrees F (-55C to 150C). Accurate to 1 degree F over the entire temperature range. Includes technical reference, software examples and ADC-16 Data Acquisition Software for Windows which allows you to label, display temperatures, log temperatures and perform other functions (for use with all Windows versions including XP, Vista, Windows 7, 8/8.1 and Windows 10). 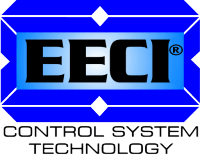 Software is also provided that allow the temperature inputs and/or relays to be controlled or monitored over a network (LAN, Internet, etc. ).TE-8 ribbon cable length is 15". Dimensions are 1" by 3". /A422 or /A485 OPTION: The serial I/O is configured for the RS-422 or RS-485 interface, allowing up to a 4,000 foot distance between the PC and ADC-16 (for use with the ADC-4, ADC-8 and ADC-16). /E OPTION: Port #1 is configured for temperature input (-40 degrees to 146 degrees F) using the TE-8 temperature input conversion (for use with the ADC-8, ADC-16 and AD-16). Includes 8 temperature sensors, 8 trimmers and terminal block. /F OPTION: Port #2 is configured for temperature input (same as above, for use with the ADC-4/I, ADC-16 and AD-16). /G OPTION: Port #1 is configured for 10 bit resolution (for use with the ADC-8, ADC-16 and AD-16). 10 bit resolution will allow you to have up to 1,024 increments in the range of measurement. /H OPTION: Port #2 is configured for 10 bit resolution (for use with the ADC-4/I, ADC-16 and AD-16). /I OPTION: Optional port #2, 8 channel analog input port for use with ADC-4. /Z OPTION: This option is for use with customized hardware. PLEASE NOTE: The ADC-4, ADC-8 and ADC-16 require a power supply, connecter cable and terminal block to function. Select the power supply and terminal block for your application and the proper cable for your computer. The EX-16, AD-16 and ST-32 expansion cards require the RC-20 ribbon connecter (sold separately) for connection to the A/D converter. To order the standard ADC-16 analog to digital converter, specify part number ADC-16. The standard ADC-16 will be supplied with an RS-232 serial interface. To order any of the above options, add the proper suffix to the part number. Any number of options may be included by adding the proper suffix to the part number. use ADC-8/E ... to order the ADC-8 with port #1 configured for temperature input. use ADC-4/A/I ... to order the ADC-4 with RS-422 and the optional 8 bit port #2.
use ADC-16/A/E/F ... to order RS-422 with ports #1 and #2 configured for temperature input. The ADC-T series temperature interface allows up to 12 temperature sensors (included) to be connected via any available computer USB port. Up to 136 relays may be controlled or 136 status inputs may be monitored (or combinations) with the addition of the optional expansion ports and the EX-8M Expansion Module (or EXM-8, EXM-16 or EXM-32 Relay I/O Expansion Modules). Standard resolution provides 1 degree temperature increments or the optional extended resolution provides quarter degree increments. The EN-D Instrument Case may be used to house the ADC-T if an enclosure is required. LabVIEW compatible, includes LabVIEW VI, graphic software example and DLL library. 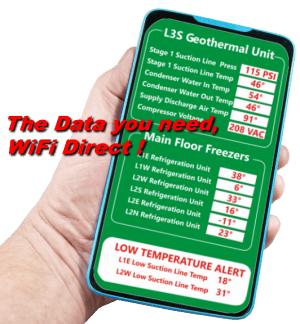 Software interface, driver, temperature control software, data logger software, remote network/Wi-Fi software and source code examples included on CD. The selection of the analog resolution needed for a particular application is generally based upon the accuracy of the sensor or device connected to the analog input. An 8 bit analog to digital converter will divide the measurement range into 256 increments. A 10 bit analog to digital converter will divide the measurement range into 1,024 increments. An 11 bit analog to digital converter will divide the measurement range into 2,048 increments. A 12 bit analog to digital converter will divide the measurement range into 4,096 increments. A 15 bit analog to digital converter will divide the measurement range into 32,768 increments. A 16 bit analog to digital converter will divide the measurement range into 65,536 increments. 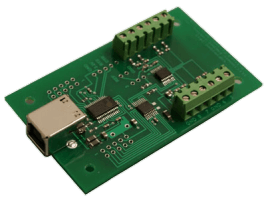 Since most temperature sensors are only accurate to about 1 degree, an 8 bit analog to digital converter will be suitable for measurement of outdoor temperature since the 8 bit converter will allow up to 256 degrees of measurement in one degree increments. Another example might be a pressure transducer with a working range of 0 to 1000 PSI. An 8 bit converter would present this information in approximately 4 PSI increments... 0 PSI, 4 PSI, 8 PSI, 12 PSI, etc. (1000 divided by 256 equals about 4 PSI). A 10 bit converter will present this information in about 1 PSI increments... 0 PSI, 1 PSI, 2 PSI, 3 PSI, etc. A 12 bit converter will present this information in about quarter PSI increments.